Sourced from the finest sustainable tree plantations in Indonesia, our 26 Bottle Stackable Wine Rack Kit is now more durable, more beautiful and more eco-friendly than ever before. Hand-cut and hand-sanded for a remarkably even color and grain. Stack on top or side-by-side. New and Improved--Stronger in Mahogany! Sourced from the finest sustainable tree plantations in Indonesia, our 26 Bottle Stackable Wine Rack Kit is now more durable, more beautiful and more eco-friendly than ever before. Hand-cut and hand-sanded for a remarkably even color and grain. Stack on top (while supporting to the wall) or side-by-side. Support braces are included for strength and stability. Easily stackable these wine racks are design to hold up to 26 bottles of your favorite wine. Easy assembly with pre-drilled holes. What size bottles does it hold? BEST ANSWER: The rack works very well with standard siza bourdeax (Cabernet Sauvignon) and Burgundy (Pinot Noir). For magnum sizes, it works well in every other one as side by side they are too tight. When assembling the racks I discovered that using larger Dowels (which may require slightly enlarging the holes made it very strong and stable. I also added a drop of white wood glue and they stack nicely and are sturdy. Champagnes are the only 750ML bottles that are a concern. I place them only on the top row and in alternating fashion to fit them. This definitely does NOT hold Oregon Pinot Noir bottles. If you want to put 13 in, you have to turn at least one bottle around. These can technically hold up to a magnum but you will not be able to fit 13 per row if you did all magnums. 750 ml. bottles, not magnums. Love it ! I presently have 4 racks holding 13 bottles each. Will buying a 2 rack allow me to stack on top the other 4 safely? BEST ANSWER: I have 10 racks but I chose to anchor the top 4 to the wall, using 2 pieces of 1x2. Works fine. Perfectly stable when anchored like this. Yes, mine go 12 racks high. As long as the floor is stable, it will be safe and lean slightly backwards against the wall. Yes you are able to stack on top of the racks you currently have if those racks are the same as the racks in question. I wouldnt hesitate. These units are very well built with sturdy materials. Yes. This rack holds 26 bottles and is very solid and sturdy. Good luck!! Yes, I did that - it's an easy add to hold 26 more bottles. Mine is 12 rows high. Still sturdy. Can these be mounted to the wall? BEST ANSWER: The only way you could mount these on the wall would be to securely fasten a shelf to the wall (shelf should need to be 48 inches long, 12 inches deep) and place the racks on the shelf. You would need to be mindful of the weight of the rack with wine and plan accordingly in terms of type of shelving system used - making sure you fasten to studs behind the drywall, etc. I imagine they could but it wouldn’t be easy. First they stack like legos so you would need to attach each shelf to the wall. Second, when you fill the rack it is pretty heavy. If you are hanging them you will need to make sure that it can hold the weight. Can this product be custom stained at home? BEST ANSWER: yes, absolutely. The delivered product is very much raw wood - no treatments at all. Before or during assembly this can be stained whatever color/hue you would like. 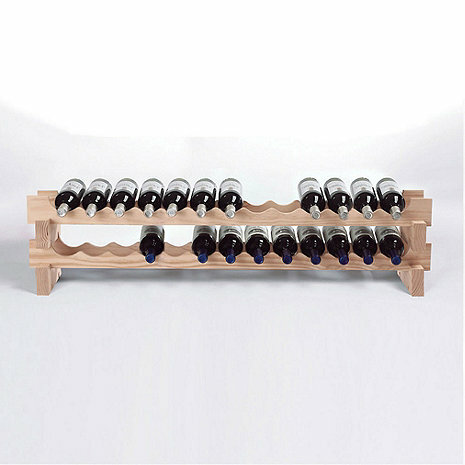 The 26 Bottle Stackable Wine Rack Kit (Natural) can definitely be stained at home to match your decor. I used a walnut stain on this wine rack when I got it home. Can you buy this as a unit of 3 racks (39 bottles)? Each rack comes with two rows. You would need two racks if you wanted 3 rows. Nope, they come in sets of 2 rows. So you would have 26, 52, etc as they are stackable. BEST ANSWER: The 26 Bottle Stackable Wine Rack Kit is made from Mahogany which is sourced from the finest sustainable tree plantations in Indonesia. Very easy to assemble. Strong enough to stack 12 levels without securing to the wall. A cost efficient way to organize your wine. Looks nice. Can add levels later as you collect more wines. This wine rack fits above our kitchen cabinets and is not only useful and a space saver, but attractive as well! Since we placed it in our new home, everyone has been complimenting it and asking where we purchased it from! A beautiful and wonderful item! We took our wine out of boxes onto these racks, we bought 3 sets and love them. I love this product. I have several collectible wine bottles. These racks display them very nicely. I already have to get another one! They are well made, were easy to assemble when they came. A great way to display your bottles. Just what I was looking for. Stable and stack well. I am using three now and might buy a couple more. All the compnents are made of Mahogany which is a nice, solid hardwood, with a good feel and substance, which also had no warping issues. That made assembly and the stacking of four shelves (two sets) very easy. It's good product at a reasonable price. I already had 8 of these racks. They are simple, functional, and relatively inexpensive. We put this rack on top of the kitchen cabinets. Perfect fit for the 2 layers of bottles. Orignally thought this was pine, so was a bit surprised by the price, but now I see they bill it a mahogany, so that might explain it. We had purchased this (or similar) product before, so knew what to expect. Functional and relatively cheap were the requirements and this fit the bill. My only complaint is it was backordered for a few weeks, but I was in no hurry. A well-constructed, functional wine rack that I use to expand limited room in my pantry wine rack. Easy to assemble. good sturdy solid mahogany wine rack. Looks nice and stacks easily. I had a bit of a problem installing them because one of the dowel didn't fit, but nothing that a drill couldn't fix. As advertised - went together well. Added storage to existing cellar. I have searched high and low for good quality, inexpensive wine storage and have found no better than these. For the money, these are even better than you would expect. The quality of the wood is excellent, assembly is effortless, and they look wonderful adjacent to the mahogany cube storage - which I use when storing full cases of the same wine. I have mine installed atop heavy duty shelving - but you could stack four tiers easily without needing additional support from toppling. Started out with one set ended up with eight sets for my mini wine collection . Fast and easy to set up take out of the box quick assembly. Ordered 4/13 arrived 4/19 with free shipping! Arrived in perafect condition----did not use customer service---only can assume that it is highly rated! THANK YOU. four foot long storage shelves. organize our wine according to vintage and type. This is exactly what I was looking for. I'm definitely buying more units in the coming months. We found this to suit us quite well. We ordered two then added more as we needed to expand our storage. Very nice looking hard wood. Slight variant in wood grains and flow make it appealing to the eye. Tight, well made assembly points make the unit solid after assembly. Used in basement for storage and stacked two together and works great and efficient use of space. Added another set to the 2 sets I bought a couple of years back. Perfect fit. The benefit of this rack is that it will fit all formats of 750ML bottles unlike some of the others. Perfectly functional for its designed purpose. Very economical -- solid -- exactly what I was looking for! I bought two after we made wine last year and will need two or three more for this years harvest. Fit perfect next to my chiller in basement. Had delivery in three to four days. On my Christmas list already. Perfect size for space. Stackable design is efficient for future needs. The wood is clean and neat, easily assembled, and next stack fits even with wine on the base unit. Great for an expanding cellar. A wonderful addition to my humble "cellar" ! I should buy 3 more!!!!! The intended use of this item is for wine storage - it would work as a display item if your home and furnishings are casual. It is very easy to assemble and very sturdy. I set up my racks in a closet. Previously, my wine was stored in boxes - the bottles are now more visible and easier to find. This is the perfect item given what I was looking for. If you are looking for an inexpensive way to stack and store your wine, this is a great product. If you are looking for a piece of furniture or something to display wine in your living area - there are other display units better suited for that purpose. The 26 bottle stackable wine rack is well made and easy to assemble. It very well serves the purpose for which it was purchased. I would recommend it if you are looking for a simple solution to wine bottle storage. Great purchase for our Pinot Noir Stash! Great value. Well made. Easy to assemble. Purchased this set of racks after reading reviews of the other types. We have a lot of Pinot Noir and was afraid they might not fit well in the other racks. Very happy with purchase. The only limitation, if that, is that you have to have a surface on which to stack these racks. I would not recommend starting on the floor. We used an old coffee table and it worked out fine. Had so much wine in boxes, we ended up ordering more racks. Now we know what we have!! We have a wine closet with shelves that are short but wide. We purchased a couple of these racks, and they fit perfectly into our space. Easy to assemble and look nice. Sturdy and very functional. We will be purchasing more of these! It is what it is. Very basic and practical. Took ten minutes to put together. Attractive but I woudln't keep it in my living area. Easy assembly. Works well. Reasonable cost. Good materials. I have had some of these racks for decades. When I moved from MD to NM I brought them w/ me. I have since bought more. I now have 14 single racks in total. Only the lower racks have bottles of wine on them. I will soon be anchoring all of the racks to the back wall, so that when they all are full, they can not shift and crash down. They are made of unfinished wood. You can leave them natural, as I have done. Or, you can stain or paint them. Easy to assemble, nice looking, reasonably priced. I stacked two kits for 52-bottles total, and probably will buy one more to get 78 bottles. Don't think you'd want to do more than three kits unless you used a wall anchor to avoid tipping. Highly recommended. Nice solid rack. Got the bottles we needed and it looks very nice! Worked perfectly in our wine cellar. Lots of parts but my husband has the patience and put them together perfectly. Like size options because we have an old house. good for tight spaces like closets. under no circumtances move it once built! The only drawback someone may have with this wine rack is some of the bottles are almost on the floor. Stacked 4 units high - and it works! My four high stack is functional and stable. Ordered 10 to start my cellar and it was NOT necessary to ship LTL! It's easy to fit in a regular closet and take advantage of unused space. You can easily add more space as needed. Simple funtional nothing special but works well. wine rack was easy to assemble and is sturdy. I use this wine rack in a closet because I just downsized to a retirement community. Easiest product I have ever put together. I stacked one unit on top of another and it is very sturdy. This product is MUCH better than the first rack I purchased. It was easy to build, holds bottles securely, and is modular. I will be buying more of these in the future. It's not the most attractive rack, but at this price point, I don't think you can beat it.